Very Early Beautiful Hamilton Tank Watch Runs Perfect. No reserve! Hamilton 992B 16 size 21 jewel Railroad Grade Pocket Watch Amazing Condition. It has kept excellent time over the past 48 hours. This is a collectors grade watch. Please feel free to ask any questions and thank you for looking. Up for your consideration is a Hamilton 992 Elinvar pocket watch with original box and paper work. The watch appears to be in almost new condition. The watch appears to work great. This is a very nice HAMILTON pocket watch in a gold filled case. The watch is size 12 and it has 19 jewels. We see no dings or dents in the case and there is no brassing. The crystal and hands are very nice. W 44A. HAMILTON, 12 SIZE,14 K SOLID GOLD CASE, 23 JEWEL, GRADE 922, STIFF BOW CASE POCKET WATCH. A FINE ALL ORIGINAL HAMILTON 12 SIZE GRADE 92,2 23 JEWEL, IN RUNNING CONDITION, FROM AN ESTATE, BEEN IDLE FOR MANY YEARS. BALANCE WITH GOOD ACTION, HAVE NOT CHECKED FOR ACCURACY. MOVT. MARKED HAMILTON WATCH CO LANCASTER, PA, 23jEWEL, 922. ADJD TO 5 POS, MADE IN USA, 3,004,705. CASE MARKED WADSWORTH 14 K SOLID GOLD, ,CUVETTE MARKED HAMILTON WATCH CO, LANCASTER PA. CASE WITH STIFF BOW AND SNAP ON COVERS AND BEZEL. THE METAL SILVER DIAL WITH BOLD BLACK ARABIC NUMERALS. WATCH COMES WITH A N.O.S. GLASS CRYSTAL. New ListingVintage Hamilton Railway Special 992B 21 Jewel 10k Gold Filled Pocket Watch!!!! This watch is in good condition with minor surface scratches throughout from wear and age. The dial is a triple sunk white dial that has a few cracks on it. The hands are blued with black hour indicators. 4.5 out of 5 stars - Vintage Hamilton Railway Special 992B 21 Jewel 10k Gold Filled Pocket Watch!!!! 3 product ratings3 product ratings - Vintage Hamilton Railway Special 992B 21 Jewel 10k Gold Filled Pocket Watch!!!! Nice Nickel Screw Back and Bezel Open Face Case. Front and Back Bezels Screw Off and On Smoothly. Dial Faces Up Very Well and This Chip is Very Hard to See. Nice Original Spade Hands. Very Nice Crown. Grade: 992B. Manufacturer: Hamilton. Estimated Production Year: 1946. Jewels: 21j. Plate: 3/4 Plate. Run Quantity: 37,500. Total Production: 685,500. Watch runs. (Lost ten minutes in 18 hours.). Plastic crystal. This case was made especially for the HAMILTON 16 SIZE 992 AND 992b. This is a WADSWORTH case and is in good functional used condition. This case has a glass crystal, good bow, GOOD CLEAN SIGNED CROWN, good stem, and good covers. REFERENCE #: #992. HALLMARK: Hamilton 14K. However, we will accept Cashier's Checks if noted upon checkout. We pride ourselves in carrying high quality estate and antique jewelry. This is not negotiable. This is an original Hamilton cardboard box, ivory bakelite "cigarette" case and original paperwork for a Hamilton 950b pocket watch. Fantastic pre-owned condition, as seen in the photos, and very collectible. These are quite rare to be in such good condition and in the complete set. HERE IS A NICE 992B HAMILTON POCKET WATCH. IT IS RUNNING AND ALL FUNCTIONS WORK. IT IS IN A HAMILTON WATCH CASE. THE BOW IS STIFF AND STAYS WERE YOU PUT IT. THE BEZEL AND THE BACK SCREW OFF AND ON WITH EASE. 25YR BOSS KEYSTONE CASE, VERY NICE. MONO ON FRONT COVER. GREAT ADDITION FOR THE COLLECTOR. NO RESERVE. This lot contains a Hamilton 16 Size “IN HOC SIGNO VINCES” Pocket Watch. This is a very interesting and unusual watch. I have never seen a watch quite like it. The watch has a yellow gold filled hunting case with eagles on the cover and the center signed ‘IN HOC SIGNO VINCES” WITH A CROSS IN THE CENTER. The bow shows very little to no wear and holds firm, and the winding crown is sharp. The front bezel and back covers screw on and off correctly and fit tight. All the case numbers match as well. The crystal is plastic, but is clear with only light normal scratches. The serial number is 963,179 which puts this made between 1899-1900. This is in a hunter case rather than open face, the case is gold filled is not showing brassing yet has been carried many years. BEAUTIFUL HAMILTON RAILWAY SPECIAL DIAL WITH VIVID SHARP BRIGHT MARKINGS! EXCELLENT GLOSSY 992B BLUE HANDS! VERY NICE MASONIC ENGRAVED HAMILTON 10K GOLD FILLED CASE! Minor brass?. scratches and dings. Serial numbered 859689. The gold filled case shows wear. Hamilton Pocketwatch ca. 1919-20. This Hamilton engine is screaming to be re cased. Or just repair stem and crown and give it a good cleaning, basic. Good Dial with a lot of surface dirt. Will clean up nice. Grade: 992. Manufacturer: Hamilton. To Finishing Dept: Jan 23, 1926. Jewels: 21j. Run Quantity: 3,000. Jewel Setting: Gold Settings (Screw-Set). Center Wheel Material: Gold. Standard Dial Type: Double-Sunk. We observe if it is ticking or not and may report if it appears strong or sluggish. We note any visible missing parts. We do not test for accuracy and do not test for more than a few minutes. See the photos. Here we have a nice used Hamilton GCT AN 5740-1 AF 58 Vintage Military Pocket Watch Case. The back screws down about 1/2 turn and then stops. It will need the threads repaired before use. Please see pictures and ask any questions you have. Condition is Pre-owned. Shipped with USPS First Class Package. MINIMAL WEAR FOR AGE, WORKING GREAT CONDITION, CRYSTAL HAS A FEW SCRATCHES NOT BAD, DIAL FINE. GREAT ADDITION FOR THE COLLECTOR. IF THERE'S A REFLECTION IN PICS THAT'S ALL IT IS. NO RESERVE. It winds and sets easily, has been running well while tested for the last 2 weeks. See item specifics for more details. Case, dial and crystal are in good condition. Grade: 992. 992 Special. Manufacturer: Hamilton. To Finishing Dept: Oct 14, 1926. Jewel Material: Ruby & Sapphire. Pallet Jewel Material: Sapphire. Barrel: Going. Jewel Setting: Gold Settings (Screw-Set). Vintage Hamilton 10K Gold Filled Hand Winding Railroad Pocket Watch. Swiss movement. Case has no glass. Winding and keeping time. Was not able to open the case. Beautiful timepiece to add to your collection. Please review pictures. If you have any questions please ask. We combine shipping. Please wait for an updated invoice before paying. 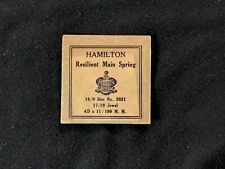 This dial is signed “HAMILTON RAILWAY SPECIAL” in block. This Swiss dial is in gorgeous clean condition. The dial has feet at 22.5, 38 and 57.3 minutes after the hour. This case was made especially for the 992B and is signed Hamilton. This is a wonderful used case. The case has a glass crystal, good bow, good solid crown, good stem, and good covers. The COVERS CLOSE TIGHTLY The back cover has slight scratches but is in overall good condition. IF THEY ARE NOT RUNNING THAT WILL BE STATED. WE ARE NOT WATCH REPAIR EXPERTS NOR DO WE PRETEND TO BE. BATTERY OPERATED WATCHES ARE UNTESTED AND ARECONSIDERE D NON RUNNING UNLESS OTHERWISE STATED. "ALL WATCHES ARE SOLD "AS IS". HOUSED IN ITS SPOTLESS FACTORY ORIGINAL CASE, REAR LID STILL CARRIES 100% OF ITS ORIGINAL SPUN BRUSHED FINISH! UNSERVICED BUT RUNNING STRONGLY WHEN WOUND. ORIGINAL GLASS CRYSTAL IS INTACT AND CLEAN. Very nice shape. No dings or dents. From a watch repair man's estate. Grade: 974. Manufacturer: Hamilton. To Finishing Dept: Jun 24, 1915. Barrel: Going. Jewel Setting: Screw-Set. EXCELLENT GLOSSY BLUE HANDS! A . WINDS, SETS, RUNS, EXCELLENT! LEVER SET! STRONG STEADY BEAT! VERY NICE DUEBER 20y GOLD FILLED CASE! Minor brass, wear scratches and dings. BEZEL AND REAR COVER screw on and off good, a bit tight but screws on all the way nicely.EXCELLENT CLEAR GLASS BEVELED CRYSTAL! No brassing of the gold filled case is evident. Dates to about 1923. See photos for detail. This watch has been tested and is fully functional. Size 16s, 21Jewel, Grade 992. Hamilton.serial# 865153.estimated date 1912. It is 16 size, open face, stem wind, lever set, 21 jewels, marked “992”. Adjusted, striped damascening, gold center wheel. Serial #1728582. The dial is porcelain. The hands are original, but they are rusty. Nice antique watch with gold filled case. Watch winds up and runs. missing crystal and cracked dial. We ALWAYS will attempt to make things right. HAMILTON 21 JEWEL Railroad POCKET WATCH --940--5 POSITION--WORKS PERFECTLY. Condition is Pre-owned. Shipped with USPS First Class Package. 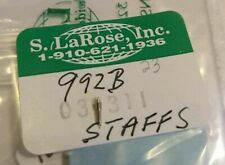 Hamilton 767 768 #607840 Balance Staff Nos. The soothing, steady sway of motion rocks you to sleep as the train rushes down the tracks. Keep the nostalgia of railroad travel alive with your own Hamilton pocket watch. First manufactured in 1893 for the railroad worker, its precision and accuracy exceeded the strict guidelines set for the industry. The watches have a Montgomery dial, ensuring you get an easy-to-read face with clear and distinct numbers. Available in different styles, you can find one in solid 14K white or yellow gold. A World War I-style Hamilton 992 pocket watch, with its gold lettering and center wheels, is one of the most collected watches in the United States. Post-World War I vintage Hamilton pocket watches, designed for the elite, feature expensive mechanical parts, including gold screws, wheel sets, and cases. Made in the U.S., these pocket watches hold true to American craftsmanship and are reliable and accurate. With the vast inventory on eBay, you can find the ideal Hamilton pocket watch. Whether it completes your collection or starts it, owning one of these pieces of railroad history is a treasure. Shop the large inventory of vintage and antique jewelry including Hamilton pocket watches!